I used to love as a child going with my parents to antique fairs, car boot sales and auctions. They are collectors of antiques and curios and they soon got me interested in what to look for in items and what prices I should be paying for them. I studied 'textile design' at Heriot Watt and left with an honours degree in 'Textile design' specialising in constructed textiles. Whilst many of the students concentrated on working on garments and interior textiles, I decided to concentrate on creating jewellery designs instead. By weaving and knitting gold and silver wires and combining them with crystal and pearl beads, I was able to create unusual and beautiful pieces. My course provided me with valuable business and creative skills and knowledge of design processes. These has been invaluable to me as a designer in practice. Since graduating, year on year, I have built up further knowledge and skills through experience and trial and error. I started out by selling the knitted pieces and found that the vintage brooches I had collected over the years looked good on them. This kind of jewellery seemed popular with brides to be, therefore, I exhibited at wedding shows and fairs at this point. Since then my designs have evolved into creating vintage pieces which are full of charms, keys, cufflinks and anything else I like the look of. This is now the signature 'look' of my work. I especially enjoy upcycling vintage jewellery in my work. It is pleasing to see something which no longer has much use or appeal given a new lease of life in one of my designs. Using vintage and old jewellery means you are working with original material and no two pieces are the same. This always makes the outcome of the design that little bit more exiting. Over the sixteen years which I have built up the business, I have became busier and busier. This is mainly through doing more annual shows and fairs to get my work out there. I had worked a part time job as a visual merchandiser for several years, but due to me wanting to concentrate more time to my business, I gave this up two years ago. Around this time I got an extension on my house, which provided me with a nice big room I could use as my work room. I have no idea how I managed before as there would be jewellery on any surface/nook or cranny in the house which was available. The workroom now seems to be bursting at the seams and I could almost do with another extension! It is my special room and I often get a telling off from my husband when we are having a weekend or evening off - if I have disappeared, he will know where to find me every time! 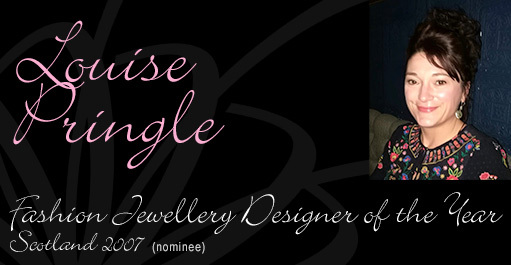 I won 1st Prize in the Jewellery Category of the International Gift Fair in Scotland 2008 and I was nominated for the Scottish Fashion Accessory Designer of The Year 2007. My Jewellery can be seen in the most unique places such as the British Museum, Russell Square, London, Edinburgh Castle and The Royal Collection, St. James Palace, London..wonderful places for such unique pieces! Proudly I have managed to have one of my signature bracelets featured in Vogue and Grazia magazine and many other publications over the years..